​Lorand Kis and his multiple talents aren’t just skills he’s developing, they are a lifestyle! Between songwriting, recording, band rehearsals, live performances, acting, auditions and all the accompanying training to hone his skills, there isn’t time for anything else! Lorand has created a unique yet familiar blend of organic pop/soul songs with a contemporary edge in melody, lyric and production. 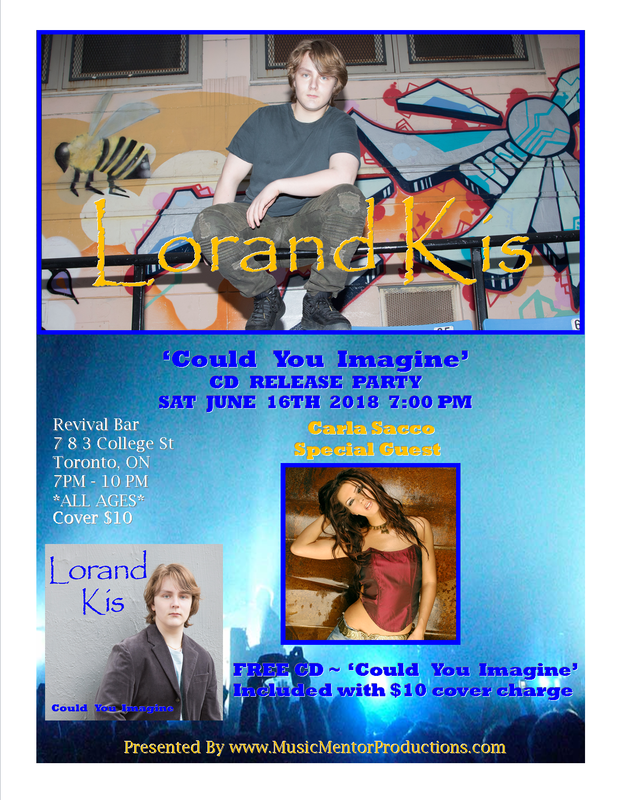 Listen now to Lorand's debut pop soul album - Could You Imagine, which has been internationally released. Lorand Kis on iTunes - purchase Could You Imagine now! His music is uplifting and empowering. One listen and you will hear that Lorand’s ability to craft a song is far beyond his young years. Working with CCMA and CMAO nominated producer Peter Linseman, Lorand has written, recorded his first album 'Could You Imagine', at Music Mentor Productions Studio for this 2018 release. Lorand Kis was born in Boca Raton, FL. He is a 14-years-old who's inspiration comes from his environment, events around him, as well as his feelings and unending imagination. He was a selected contestant for a call back on 'The Voice' competition, Season 13 in Nashville, TN, being one of the youngest contestant at 13 years old. "Standing in front of my audience, performing, and seeing the effect of my music and songs it reinforces me in the most immediate way, as the real reason for standing up to sing," said Lorand. "Being able to brighten someone’s day, inspire them, or just take their minds off of their troubles for a few moments, means more than any professional achievement to date." Studying voice since he was 10 years old at the Singer's Edge Studio, Toronto’s Award Winning Music School every year since 2014, much of his growth has come from working with some of the most creatives coaches - Nevon Sinclair (works with Grammy Award winning artist Daniel Caesar) and Lizzy Clarke (lead singer for The Intentions). He is also part of is part of Elaine Overholt's celebrity’s studio - the prestigious Big Voice ‘League of Extraordinary Singers'.